Syhunt Code has been especially designed to scan web applications for various types of issues, such as Cross-Site Scripting (XSS), File Inclusion, SQL Injection, Remote Command Execution and weak validation. By automating the process of reviewing the web application's code, Syhunt's code scanning functionality can make the life of QA testers easier, helping them quickly find and eliminate security vulnerabilities from web applications. When used from within Syhunt Hybrid, Syhunt Code can also perform source code scans that are complementary to its dynamic scans. 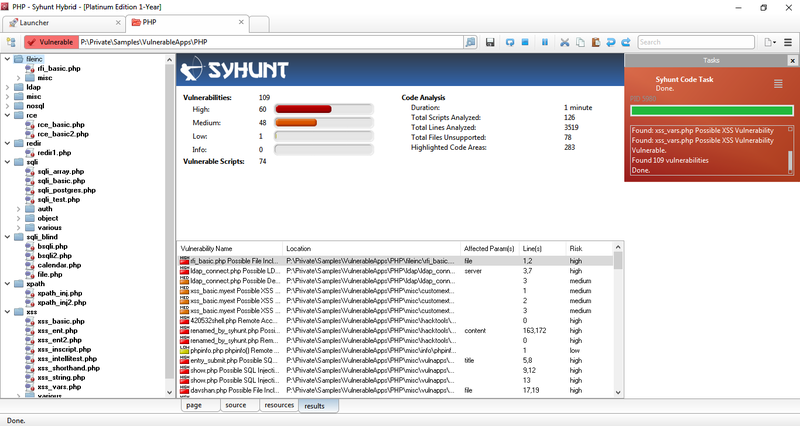 Syhunt Hybrid scans your application's source code first, then tries to remotely confirm its flaws. Supported languages include ASP, Java, JS, Lua, Perl, PHP & Python. Syhunt Code integrates with Jenkins for Continuous Integration (CI), JIRA and GitHub for issue tracking, and F5 BIG-IP Application Security Manager (ASM) for virtual vulnerability patching. Syhunt Code comes with full support for the Common Vulnerability Scoring System, an industry standard designed to convey vulnerability severity and help determine urgency and priority of response. When a report is generated, vulnerabilities are sorted by default based on their CVSS3 score. We have identified significant vulnerabilities [using Syhunt Code]. 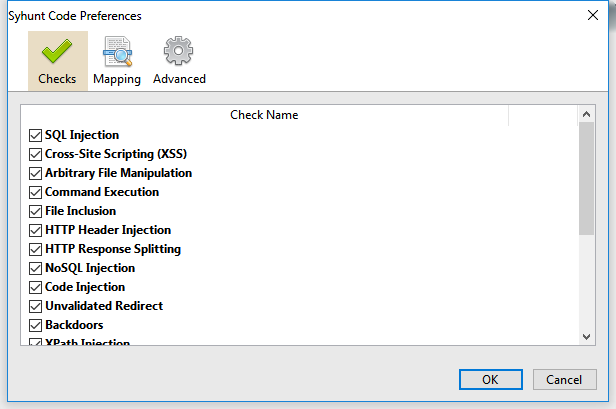 Several products we reviewed were found to have various types of injection vulnerabilities, arbitrary file disclosure and access issues and tons of XSS problems. Brent Huston, CEO, MicroSolved, Inc.